This is a terrific appetizer. Sure to have your dinner guests asking for more! 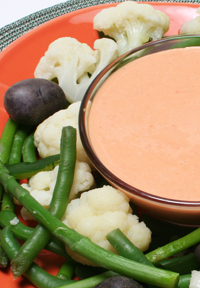 We're serving garden vegetables with red pepper aioli! While Aioli is defined as a Provençal traditional sauce made of garlic, olive oil, lemon juice, and egg yolks, it has evolved into many forms and variations. It is usually served at room temperature as a dip or condiment for everything from raw or cooked veggies to, depending on the ingredients, fresh fruit slices. So this dish is not that unusual really. It dies however, make a great way to serve up some garden vegetables as appetizers. Just dip them in the red pepper aioli! Yum! to meld or cover and refrigerate for up to 24 hours. potatoes are tender, 15 to 20 minutes. Drain and set aside. minutes and cauliflower for 2 minutes. *If possible, roast pepper yourself. peppers may be tightly covered and refrigerated for up to 4 days. 32 g carbohydrate, 9 g protein, 8 g dietary fiber, 440 mg sodium.